What Is A Rhodesian Ridgeback Dog? Anyone who knows me, knows how much I love dogs. All dogs. But especially big dogs. And puppies. I have experience with most breeds of big dogs and fancy myself as a dog breed expert in many ways. As a young child my nightly reading consisted of the bible of all dog breed reference books (yes, I am aware of how nerdy that is). So many breeds top my Big Dog Mom Favorites list: Mastiffs (of course), Newfoundlands, St. Bernards, Great Danes, and Bloodhounds. However, there is one breed that I had never given much thought to: the Rhodesian ridgeback. Until now. My friends know there is an open invitation for their dogs to come over to our house. Sulley and Junior LOVE other dogs and I am able to get my “new dog fix” while keeping my marriage intact. It’s a win-win for everyone. This weekend, we had the pleasure of puppy-sitting for my friend’s five month old Rhodesian ridgeback puppy named Blue. And when I say pleasure, I mean it. We had a blast with Blue. However, in three days I learned what no worn out dog breed bible could teach me about the Rhodesian ridgeback temperament. With the characteristic ridge along their back and stunning red coat, Rhodesian ridgebacks are a stand out in the hound group. Rhodesian ridgebacks were hunters developed in Africa to corner and hold big game prey, such as lions, bears, and boar. In addition to being used for hunting, the Rhodesian ridgeback is an avid competitor in a variety of dog sports, including agility, lure coursing, obedience, and tracking. At five months old, Blue is just getting started. From the moment he bounded into our house, Blue was like the Energizer Bunny; he kept going and going and going. He used any number of tactics to keep Sulley and Junior playing; biting their jowls, jumping on them, pawing their heads, and barking. His energy didn’t stop there. I made mistake of bringing Blue with us to a friend’s apartment for dinner Saturday night. Big mistake. Rhodesian ridgeback puppies need their exercise. And while Blue had played all day with Junior and Sulley, being cooped up in that one bedroom apartment for more than 10 min was more than he could take. His sweet, happy demeaner only slightly masked the wide-eyed, maniacal look in his eyes from the lack of space. Showing all the classic symptoms of zoochosis; pacing, carpet digging, door scratching, and counter surfing. Blue needed to get out of there! So, in 100 degree Arizona heat, I carried Blue up and down three flights of stairs and walked him around the apartment complex four separate times during the course of our 3 hour visit. And that was just to minimally maintain his sanity. Let me summarize it this way. Unless you happen to be an ultra-marathoner, if you live in an apartment and are considering a Rhodesian ridgeback, think again. Without ample exercise, a Rhodesian ridgeback will behave like a claustrophobic in a closet. Blue was such a good boy, but one look into his eyes and you could feel the intensity. When I look into Sulley’s and Junior’s eyes, I see stuffed animals and cheese. When I looked into this Rhodesian ridgeback’s icy stare I could see the look of a predator. He was smart and he knew it. He took control of Sulley and Junior almost immediately. 370 pounds of wrinkle were no match for this 40 pound dyna-Rho! Don’t get me wrong, Mastiffs can be intense and they are highly intelligent dogs. At home though, they are pretty content laying at my feet or on my bed. Blue was not so easily entertained. Rhodesian ridgebacks need physical and mental stimulation that rivals the thrill of the hunt for them. If you don’t recreate that thrill through agility, nose work, or lure coursing, they will recreate it for you in fun activities like counter surfing and base board chewing. Training a Rhodesian ridgeback forces you to have your thinking cap on because he never takes his off. My daughter asked a few times if Blue knew his name. I said “well, of course he does, he just doesn’t care that we are calling him.” As I said, a Rhodesian ridgeback puppy needs training early and often with plenty of rewards and enthusiasm. I said this about Mastiffs in The 7 Most Common Mastiff Myths Debunked, and it is even truer for the Rhodesian ridgeback; your aim in training should be to be more exciting than whatever is catching his attention. For Blue, we knew Sulley and Junior had his attention, so as long as we had their attention, we had his. I have heard that the best way to catch a dog is to run away rather than toward him. That might work for a Mastiff, but, after this weekend, I have serious doubts that it would work with a Rhodesian ridgeback. My guess is the discerning Rhodesian ridgeback might size up his options first and you would be lucky if he chose you. Most hounds are vocal, so this should come as no surprise. As I stated earlier, one of Blue’s tactics to get Junior and Sulley’s attention was to bark at them. Sulley can be very bossy and vocal himself, so perhaps he finally met his match. If you are looking for an outgoing dog that excitedly greets strangers, a Rhodesian ridgeback is not the breed for you. The Rhodesian ridgeback is dignified and reserved by nature with strangers. Our weekend with sweet baby Blue verified that even at the young age of five months, a well-bred Rhodesian ridgeback is not a Labrador retriever. With superior power and intellect, Rhodesian ridgebacks are deliberate about everything they do. From taking down 370 pounds of wrinkle to cuddling with my 11 year old daughter, this breed can be a versatile companion in the right home. I know I said 5 facts, but I’m going to give you a bonus because I was just that impressed with Blue. I suppose it is because I have adapted to life with profuse hair and slobber, that when I meet a dog like Blue, I am immediately in awe. And a little bit jealous. Everything Blue did was clean. From daintily eating tiny kibble and drinking water IN the bowl to pooping tiny poops and not slobbering, the Rhodesian ridgeback is a dream dog for the compulsively hygienic. His beautiful red coat was seemingly waterproof as well; as if it were created to repel the viscous drool from Sulley’s and Junior’s jowls. 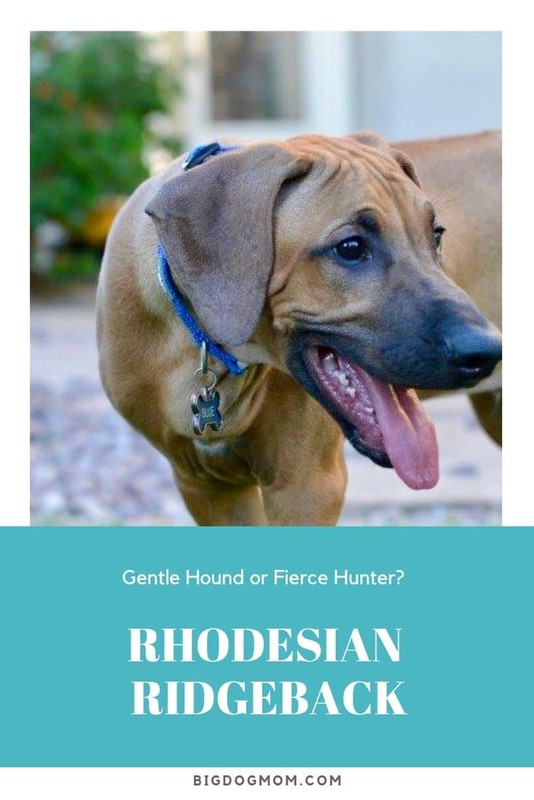 Rhodesian Ridgebacks: Gentle Hound Or Fierce Hunter? In my opinion, Rhodesian ridgebacks are a little bit of both. When exhausted from playing with Sulley and Junior, Blue was a calm, sweet puppy who was content to laze around or cuddle with my daughter. In true Rhodesian ridgeback fashion however, these fleeting moments were overshadowed by Blue’s zest for action. Harnessing this athleticism and determination would be part of the challenge and fun of being a Rhodesian ridgeback owner. Rhodesian Ridgeback Club Of The United States Complete with list of reputable breeders or rescue organizations, upcoming events, and information about health testing and breed standards. Previous Post: « What To Do About Dog Food? First, Let Go Of The Guilt! Ridgeback! You are spot on! Thank you, Fran! After a weekend with Blue, I’m considering one of my own. I need a running buddy. The only thing my Mastiffs are good for is snoring next to the treadmill. Haha! Great post and as a breeder/handler/owner of Ridgebacks, your view of them was spot on. Sounds like Blue had a wonderful time at your house! Thank you, Kathy! That is a huge compliment from someone who knows the breed as well as you do. After spending the weekend with Blue, I felt compelled to share how very unique and wonderful this breed is. We will be spending Labor Day with Blue again and I can’t wait! Fantastic points, Gracie! Thank you so much for contributing such wisdom. I agree with you about the Ridgeback’s ability to spring into action at a moments notice, but to be relatively calm otherwise. I might have been a bit unfair to Blue and the breed in featuring so much of the energetic side. I do think his energy was on overdrive because of my Mastiffs. My boys tend to bring out the crazy in all of us I guess. Ha! Also because he is a puppy. Our 5 year old was much like Blue at the same age. Now he is content to laze around most of the time, though still eager for walks and beach time. Yes, great point. Blue is in his prime wild puppy stage right now. Fun times! Thank you so much, Warren! I just discovered your blog. Great article on RRs. I was unfamiliar with them until my family adopted Meg, a Rhodesian/Whippet mix, and learned what awesome dogs they are. She and Scout, our Lab/Golden, were inseparable BFFs for many years. My sighthound princess loved her zoomies, wrestling with Scout, and playing huntress (birds and bunnies who visited our yard did so at some risk). She was also just as happy to snuggle with her dog and human family. Both dogs have since crossed the bridge, and I still miss them but their little brother and sister are following in their pawprints quite well. I would like to adopt another Rhodesian someday. I am thrilled you found my blog! Thank you! I’m so sorry for your loss of Meg and Scout. They provided you many years of fun, humor and companionship – though never for long enough. Your description of Meg sounds so much like little Blue. The zoomies, wrestling and hunting are all very core to who he is as a Ridgeback. We are watching Blue again next weekend for 5 days and we all can’t wait! Hi there! I’m so glad you were at the blog paws chat tonight, and that I was able to find you. I have a big boy named Max who is, interestingly enough, a bullmastiff and ridgeback mix. It’s quite the combo. I didn’t know anything about ridgebacks when I got him, as the shelter said he was mixed with German Shepard (we quickly realized that isn’t true), and this post really helped me to understand that side of him better. It’s nice to have a real life example and explanations and not just a text book. Thank you again. I am definitely looking forward to getting to know you, and looking to you for my big dog resource! BTW: For being a new blogger, your site looks great. I’ve had two Ridgebacks thus far and I’m hoping to have at least one more before I die. The greatest quality I’d observed on these dogs was their uncanny ability to recognize danger around them. I suppose danger for them properly but more importantly danger for his family, me in this case. She (they were both females) will be aware of danger well before I did and they communicated in a particular fashion to me that danger. I am an anthropologist and I know a few things about human and animal behavior. Their Innate Release Mechanism (read about Animal Ethology) is particularly well developed. In Africa these dogs were used to corral, harass and chase the big cats, but, this was their more important tasks for their owners, protecting the Kraals from the big cats. Learn about what is a traditional Kraal and then you would understand what that means. The Ridgebacks would band together within the Kraal to offer an unified front to any big cat that would break the thorns fences around the houses. The cats were always the losers. At my level my Ridgebacks were always somewhere near me and my family sort of hiding and watching for danger. When walking with me they made sure nobody got to close to me when a “certain” look was obvious to them and then when close obvious to me. I could keep on writing about Ridgebacks forever but this is enough for now. I never trained my dogs at all other than sit and wait when walking with me on a leash. The rest was triggered by the behavior of others. Thanks for the time you took to read about my experience. This is so interesting, John! Thank you! I did look up what a Kraal was and your visual makes complete sense. In the now two long weekends I spent with Blue, the Ridgeback puppy, I can absolutely see that innate behavior of a hunter and protector in this breed. Not in the least aggressive, but well aware of everything going on around him with the ability to hop into action at a moments notice. Your girls sound very similar. Amazing to hear stories of these dogs being able to take down a big cat! Impressive! This is a great article – however, my 4 Ridgeback pups that live in high rises have done wonderfully. They are very well socialized (can’t just open the back door and let them out to potty), they are quiet (they normally don’t bark unless there is a true reason for it – puppies trying to get someone to play can be an exception) and are not bothered by crowds and unusual things like skateboards, bicycles, baby strollers, construction equipment. From the time they are adults, they are exceptionally good at finding the most comfortable place in the house and staying there for long periods of time. Thank you, MaryKay! I’m so happy that you’ve had such wonderful experience with this breed. So many people who read this post said the same thing about a Ridgeback’s activity level. This was my first experience living with the breed for a few days and so I’m sure it was confounded by a couple of things; my own dogs and their desire to play and the fact that Blue was a puppy. That said, Mastiffs and Ridgebacks could not be more different, for all of the reasons I outlined. And like any dog, each one is unique. I have no doubt that if I had the opportunity to spend 5 days with Blue’s siblings or another Ridgeback, my experience would be a little different. Hi, I am about to become the owner of a Ridgeback cross Labrador, at the moment she is only 4 wks old and she is a stunner. She is going to be for my daughter? She is all black , just wondering how big she will actually grow? I have already got two dogs, one lab cross weinmaraner and the other lab cross whippet. And got to say they are amazing. Any feed back would be really helpful. I have met many Rhoedsian Ridgebacks, and they are my firm favourite among all breeds, having had a Rhodesian Ridgeback-X-Boerboel. Mine was a rescue, and quite damaged when I got him, but he turned out to be the most loyal, and fierce, dog I ever had. Fearless, yet fearful – not quite sure which of the X-breed was dominant? I used to take him for run down the back streets, chasing him in my half-ton pickup. What a runner – me running next to him wasn’t even a challenge, hence the pickup chase. Thank you so much for the comment, Darrell! The imagery of your last statement about the nose in the crotch and “having your number” is classic. I can definitely see that being true for many Ridgebacks. As I said, they are not Labradors. They are prepared and capable hunters when they want to be. Oh, I can see my 20 month old pure RR Freya right there with Blue. So much energy and fun. We have two RR next door and she loves her friends … and talk about smart, if you say “friends” she pops up from whatever she is doing and bolts for the closest door to head to the neighbors’ house. They are definitely a pack. All three are wonderful with children and love other dogs. They are reserved when meeting new people, but do fine when given a chance to measure folks up on their own — however, they have an uncanny 6th sense, and if they don’t like someone, they will let you know and there is no going back. Walking and hiking with these pups is the best – boundless energy, but always close enough to watch out for me. Training is key though. Glad you’ve had such a lovely introduction to such a magnificent breed. My husband is an avid dog-loving cat guy who used to own and train Ridgebacks. I sent him this article because I knew he would love it. Let me tell you, you did not disappoint, he was truly impressed with how well written and accurately you describe the breed. He actually added that it’s the best he’s read! I told him, well it’s no wonder because you won the Nose-to-nose for Best Dog Blog! Your blog is just impressive. I can’t thank you enough for this! What a huge compliment from your husband! Given his expertise in the breed, I’m just thrilled he like this post! As an owner of 3 Rhodesian Ridgebacks, I had to giggle as I read your article. I think that Ridgebacks can be very energetic. But, my 3 never fit that mold. They were content to sleep on the couch most of the day. I remember my one male. When he was a 4 month old, I took him for a 1/2 mile walk. About half way through the walk he laid down and would NOT stand up. He was exhausted. I carried that 40 pound puppy home! So, energetic, he was NOT. Reserved and dignified? Yes. When a person came into the house, our dogs might lift their head up. But that was it. It was the running joke of the visitors. Counter surfers? Definitely. Do not leave ANY food anywhere that can potentially be accessed by a dog or child. My dogs could open drawers & doors to get to food. And anything on the counter was not safe. Thank you for your comment, Vanessa, and congratulations on your new addition! Have you considered doing a DNA test on him? Embark DNA is one that I have heard great things about. Most of the tests I’ve seen are fairly inexpensive for the information they give you.